Dynaudio launches The Special Forty stereo speakers | What Hi-Fi? The Special Forty is a two-way loudspeaker which uses a new, 28mm Esotar Forty tweeter, a soft-dome designed exclusively for this model. The tweeter is partnered with a new 17cm woofer, which Dynaudio believes is its best to date. It features a hybrid magnet system which sits in the voice-coil, rather than outside. Dynaudio claims this results in more power and greater efficiency. The woofer also uses what Dynaudio has dubbed an 'Airflow Basket', designed to hold the driver in place without transferring any unwanted vibrations. It uses special aerodynamic ribs to reduce reflections and improve air movement behind the cone. Both the tweeter and woofer have been designed with extended frequency reach so they can overlap without too much interference from Dynaudio's first-order crossover. 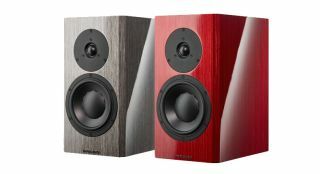 The Special Forty speakers come in two high-gloss lacquers, Grey Birch and Red Birch. These are exclusive to the Special Forty, which go on sale in June for €3000.